The Seventy-fourth United States Congress was a meeting of the legislative branch of the United States federal government, composed of the United States Senate and the United States House of Representatives. It met in Washington, DC from January 3, 1935, to January 3, 1937, during the third and fourth years of Franklin D. Roosevelt's presidency. The apportionment of seats in the House of Representatives was based on the Fifteenth Census of the United States in 1930. Both chambers had a Democratic supermajority. May 6, 1935: Executive Order 7034 created the Works Progress Administration (WPA). June 12, 1935 – June 13, 1935: Senator Huey Long gave the second longest filibuster speech in Senate history up to that time, 15 hours and 30 minutes to retain a provision, opposed by President Franklin Roosevelt, requiring Senate confirmation for the National Recovery Administration's senior employees. July 1, 1935: Charles Watkins was appointed as the first officially recognized Parliamentarian. September 10, 1935: Senator Huey Long of Louisiana died, as the result of being shot by an assassin on September 8. March 1, 1936: Construction of Hoover Dam was completed. June 4, 1936: Speaker of the U.S. House of Representatives Jo Byrns died. William B. Bankhead was then elected later that day. President: Franklin D. Roosevelt (D) was reelected with 60.8% of the vote over Alf Landon (R). Senate: Democrats gained 5 net seats during the election, and in combination with Democratic and Farmer-Labor interim appointments and the defection of George W. Norris from the Republican Party to become independent, the Republicans were reduced to 16 seats, the most lopsided Senate since Reconstruction. House: Democrats gained twelve more net seats from the Republicans, bringing them above a three-fourths majority. This was the largest majority since Reconstruction. The last time a party won so decisively was in 1866. 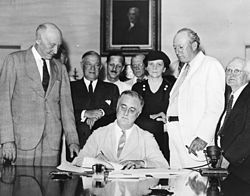 President Roosevelt signs the Social Security Act, at approximately 3:30pm ET on August 14, 1935. Standing with Roosevelt are Rep. Robert Doughton (D-NC); unknown person in shadow; Sen. Robert Wagner (D-NY); Rep. John Dingell (D-MI); unknown man in bowtie; Secretary of Labor, Frances Perkins; Sen. Pat Harrison (D-MS); and Rep. David Lewis (D-MD). Senators are popularly elected statewide every two years, with one-third beginning new six-year terms with each Congress. Preceding the names in the list below are Senate class numbers, which indicate the cycle of their election, In this Congress, Class 2 meant their term ended with this Congress, facing re-election in 1936; Class 3 meant their term began in the last Congress, facing re-election in 1938; and Class 1 meant their term began in this Congress, facing re-election in 1940. Percentage of members from each party by state at the opening of the 74th Congress, ranging from dark blue (most Democratic) to dark red (most Republican). (1) Bronson M. Cutting (R) Died May 6, 1935. (2) Huey Long (D) Died September 10, 1935. (2) Thomas D. Schall (R) Died December 22, 1935. (1) Park Trammell (D) Died May 8, 1936. (3) Duncan U. Fletcher (D) Died June 17, 1936. (3) Richard L. Murphy (D) Died July 16, 1936. (2) James J. Couzens (R) Died October 22, 1936. (3) Peter Norbeck (R) Died December 20, 1936. ^ "Huey Long Filibusters". senate.gov. ^ a b "First Official Parliamentarian". senate.gov. House of Representatives Session Calendar for the 74th Congress (PDF). Official Congressional Directory for the 74th Congress, 1st Session. Official Congressional Directory for the 74th Congress, 1st Session (Revision). Official Congressional Directory for the 74th Congress, 2nd Session. Official Congressional Directory for the 74th Congress, 2nd Session (Revision).